Starting with a collection of standard business process models allows you to compare with existing processes and then determine what gaps there may be. Business process modelling is one of the driving forces in the design of Oracle Fusion Applications. This modelling carries through to almost every aspect of Oracle Fusion Financials. The Business Process Models (BPMs) manage the deployment, upgrade, integration, and configuration of the product. Oracle Fusion documentation follows the process models very closely. Roles Based Access security is also tied closed to the BPM Model, so that tasks and activities are assigned appropriately. Messaging and online help are arranged along BPM lines. Field support uses the BPM models to organize their efforts to examine and resolve issues. Level zero (L0): A specific industry organized around raising capital, executing a business model, and reporting the resultant income to shareholders. For example, Automotive, Communications, Education, Healthcare, and Utilities, to name a few of the approximately thirty identified industries. Level one (L1): A specific business process area. Level three (L3): A specific activity. Level four (L4): Specific tasks involved in an activity. Having business processes with varying levels means you can start with high level processes and then drill down to lower levels of detail as you require. Furthermore each level will relate back to the hierarchical employee levels in an organisation. 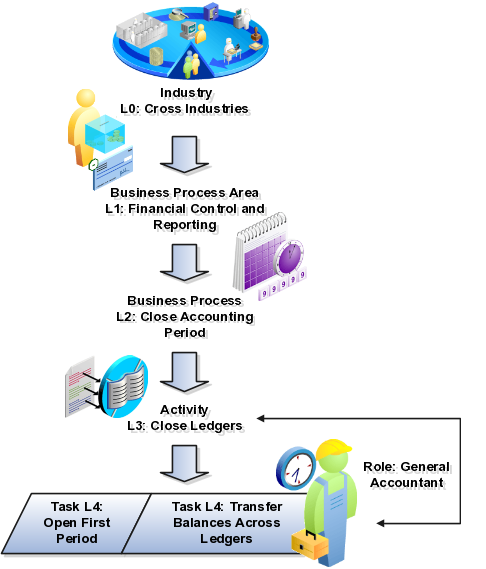 An example of how the process levels might look is outlined in Figure 1. The process flows that Oracle provide can be downloaded at Oracle Support Doc ID 1542019.1. The diagrams are pitched at L3 and are typical swim lane Visio documents as illustrated in Figure 2. I’ve also prepared a process flow listing which you can also download.